"This is simply the best-engineered scoop you’ll find." "Easy to hold and easy to use." "Three different sizes, so you’ll always have the size you need." "The handle absorbs heat so it melts the ice cream slightly as you scoop." "Great for ice cream and for muffin or cupcake batter." "All sides are tapered for ease, so this can be used either right- or left-handed." How many ice cream scoops are designed by aerospace engineers? This one was! Made without any weak points or moving parts, and with a swooping ergonomic handle, this is simply the best-engineered scoop you’ll find. It also looks elegant and, well, high end. Perfect for people who take their ice cream seriously. The magic in this scoop is that instead of requiring you to use your wrist to push, pull, poke, and pry the ice cream out of the container, this is designed so that you use your arm and shoulder muscles. It’s just as much work, but since you’re using stronger muscles, it requires less effort. While this is certainly an expensive scoop, it is nearly indestructible, so you’ll never need to buy another cheap scoop again. This Amazon Choice has stellar reviews that all say this really is worth the extra money if you scoop frequently. Scooping ice cream isn’t like serving caviar, so maybe you don’t need the fanciest or most expensive ice cream scoop on the planet when you’re dishing out the ice cream and cake for the kid’s birthday party. This is made from durable stainless steel and has a comfortable black soft-grip handle that’s easy to hold and easy to use. The pointed tip makes the first dig into the ice cream, paving the way for the rest of the scoop. The flat side edges let you snug up to the sides and corners of ice cream containers to get the last bits out, so you won’t waste a bit. When you’re done scooping, this is dishwasher safe, right along with the rest of the dishes, so it will be ready for you to use the next day. This set of three scoops gives you three different sizes, so you’ll always have the size you need, whether you’re cooking or serving. The largest scoop is 3 tablespoons for serving ice cream or dishing batter for cupcakes and muffins. The medium scoop is 1 1/2 tablespoons, which would make adorable little scoops for kids or for serving sample sizes of multiple flavors. You’ll also reach for it for batter for mini cupcakes and muffins and for portioning cookie dough. At just 2 teaspoons, the smallest scoop might not be used often for ice cream, but you could use it for portioning sauces for your ice cream, or for making melon balls, scooping cookie dough, or portioning truffles. The trigger for these is incorporated in the handle, so you just squeeze to release the food. Made from stainless steel, these are dishwasher safe for easy cleaning. They come in a box and are nestled into velvet bags, so they’re easy to give as a gift. This style of scoop is great for portioning thick, dense cookie doughs and for serving mashed potatoes, rice, and other foods that hold together well. It will also come in handy for scooping the seeds out of melons and hard squashes. When serving is done, this is dishwasher safe for easy cleaning. This ice cream scoop is practically a part of kitchen history. First designed in 1935, this has a special liquid in the handle that absorbs the heat of your hand and transfers it to the head of the scoop so it melts the ice cream slightly as you scoop. If your hands are chilly or your ice cream is super-cold, you can dip the whole scoop in warm water to heat things up even better. There are no moving parts to break, so this should last many years if it’s cared for properly. This should be washed by hand and should not be subjected to heat over 140 degrees. Scoops of this style are in use in cafeterias and diners every single day. Sure, they’re great for portioning ice cream, but they’re also great for portioning batter for muffins and cupcakes and for serving foods like rice or mashed potatoes. The side trigger is easy to squeeze, and the wiper inside the scoop sweeps the bowl clean, so you’ll be sure that every cupcake or muffin is the same size and no batter is left behind. This scoop is a size 8, which holds four ounces (1/2 cup) but the same style is available in a range of sizes from 6 (5 1/3 ounces) to 40 (4/5 of an ounce) and each has a different colored handle so you can easily tell them apart in a drawer. The handle is molded in one piece so it will stay secure, and it has grooves that make it easy to hold onto. For easy cleaning, this is dishwasher safe, and it is NSF certified for commercial use. Just when you think you’ve seen every possible style of ice cream scoop, you look again and see something a little bit different. 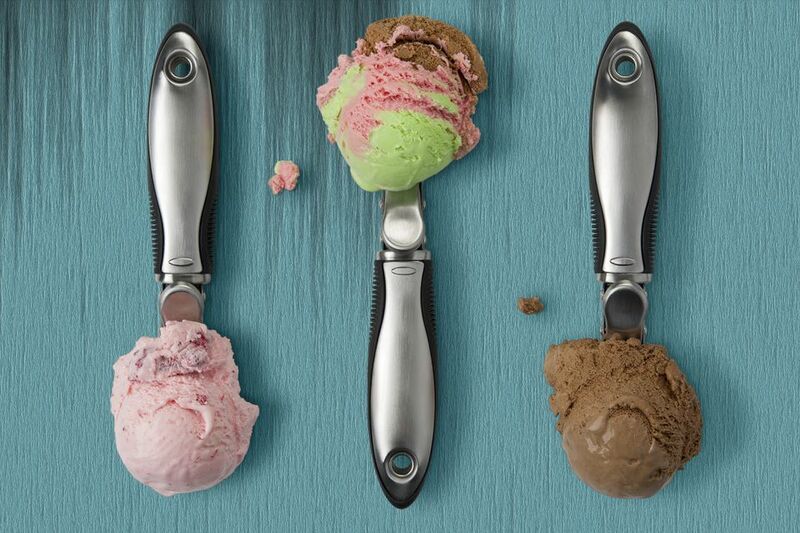 When it comes to scooping, this is much like all the other ice cream scoops you’ve used, except that you need to gently squeeze the handle while you scoop. When it’s time to serve, you simply release the handle and the bowl splits apart to serve the ice cream neatly. This is made from heavy duty cast aluminum and has a nonstick finish to help the ice cream slide out and make cleaning easier. Because this doesn’t have a side trigger or sweeping mechanism inside the bowl, and all sides are tapered for easy entry into the ice cream, this can be used either right- or left-handed. This should only be washed by hand.